Integration - The brain and spinal cord of the Central Nervous System combine and sum up all the data received from the body and send out nerve impulses. Motor Output - The nerve impulses from the Central Nervous System go to the effectors (muscles and glands). Muscle contractions and gland secretions are responses to stimuli received by sensory receptors. The Nervous System is divided into two main divisions. The CNS consists of the spinal cord and brain. The spinal cord connect to the brain via the brainstem which is situated at the base of the brain. This is composed of the medulla, pons, and mid-brain. It is in the brainstem that discrete collections of nuclei are situated for the formation of 10 of the 12 cranial nerves. The brainstem and the cerebellum. 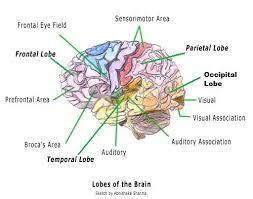 The outer layer of the cerebral hemisphere is termed the cerebral cortex. This is inter-connected via pathways that run sub-cortically. It is these connections as well as the connections from the cerebral cortex to the brainstem, spinal cord and nuclei deep within the cerebral hemisphere that form the white matter of the cerebral hemisphere. The deep nuclei include structures such as the basal ganglia and the thalamus. The CNS is enclosed within the skull and vertebral column. These structures are separated by a series of membranes known as the Meninges. The Pia Mater is separated from the delicate arachnoid membrane by the subarachnoid space, which is then in turn separated from the Dura mater by the Sub-dural space. The cell body contains the nucleus and surrounding cytoplasm. It is the focus of the cells metabolic processes, housing the mitochondria, golgi apparatus and peroxisomes. The Dendrites are neuronal processes that taper from the cell body outwards. They produce many branches and transmit information towards the cell body from synapses on the dendritic tree. their primary role is to increase the surface area for synapse formation, allowing a great number of synapses to integrate together. There is only one Axon per neuron. originates at the axon hillock conducting information away from the cell body towards the nerve terminal and synapses. It can however, branch to produce several processes. The initial segment of the axon, as it emerges from the cell body, is the most excitable part of the neuron because it has a high density of sodium channels at this point. Therefore, it is at this point that the action potential is generated. A Lipid bilayer (cell membrane) encloses the neuron. It is within this that proteins are located. Some of these form ion channels, others form receptors to certain chemicals that are released by neurons. Others act as ion pumps, moving ions across the membrane. e.g Na+ - K+ exchange pump. The Axolemma is the axonal surface membrane while the axoplasm is contained within it. Many axons are surrounded by a Myelin sheath. This alters the conducting properties of the axon, allowing for fast action potential propagation, while the strength of the signal is maintained. This is able to happen due to the gaps in the sheath called the Nodes of Ranvier which contain many ion channels. The myelin sheath surrounds the axon from the origin near the cell body along the length of the axon to the terminal, before the axon branches. The myelin sheath is formed by Schwann cells in the PNS and Oligodendrocytes in the CNS. The synapse is the junction where the neuron meets another cell. in the CNS this will be another neuron. however in the PNS this may be a muscle cell, glandular cell or other organs. The physiology of synapses will be dealt with on the Physiopedia page Introduction to Neuro-physiology. There are four main classes of neuroglial cells within the CNS. Astrocytes: Small stellate cells. Found throughout CNS. Form structural and supporting framework for neuronal cells and capillaries. They maintain integrity of blood brain barrier (BBB). They store and release some neurotransmitters. Disperse excess ions. Important role in development of NS and may have a role in injury recovery. May have a role in presenting antigen to the immune system when CNS and BBB damaged. Oligodendrocytes: Responsible for myelination of CNS neurons. Large numbers in the white matter. Each Olig. forms myelin for 3-50 fibres, and many others surround fibres without forming sheaths. Clinical disorders of these cells cause central demyelination in conditions such as multiple sclerosis. Ependymal cells: Important for enabling movement of cerebrospinal fluid (CSF) as well as interacting with with Astrocytes to form a barrier separating the ventricles and CSF from neuronal environment. They line the central canal in the spinal cord. Microglial Cells: found throughout white and grey matter of the CNS. They are phagocytic in nature. Mediate immune responses within the CNS. Schwann Cell: Found only in the PNS. Responsible for the myelination of the peripheral nerves by wrapping the cell around the axon. There are multiple layers of scwann cell membrane wrapped around the nerve. 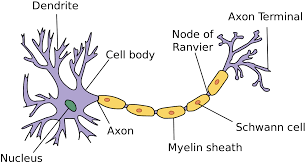 One schwann cell wraps around one axon and provides myelin for one internode. They are important for regeneration of damaged peripheral axons. The spinal cord lies within the vertebral canal, extending from the foramen magnum to the lowest border of the first lumbar vertebra. It is enlarged at two sites, the cervical and lumbar region. 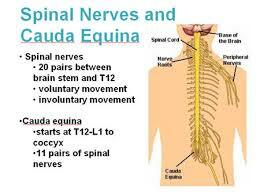 The lower part of the spinal canal contains the lower lumbar and sacral nerves known as the Cauda Equina. 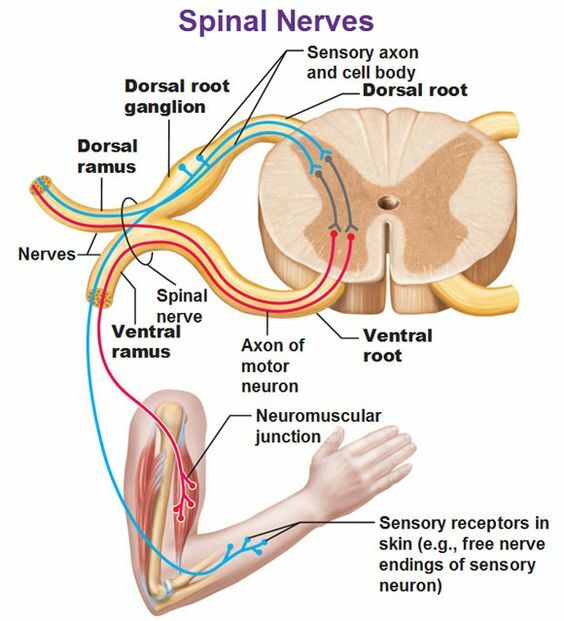 Sensory nerve fibres enter the spinal cord via the Dorsal (posterior) roots. The cell bodies for these neurons are situated in the dorsal root ganglia. This short video clip gives an overview of spinal cord anatomy. Spinothalamic tract: From Dorsal horn laminae I,III,IV,V. crosses midline in spinal cord, projects to brain stem and contro-lateral thalamus. Conveys pain and temperature. Dorsal column Medial lemniscal pathway: Afferents from mechanoreceptors, muscle and joint receptors. terminates in dorsal column nuclei of medulla. Forms medial lemniscus at this level and synapses in ventroposterior nucleus of thalamus. Conveys proprioception, light touch and vibration. Spinocerebellar tract: From spinal cord interneurons. It has two tracts a) Dorsal SCT relays via inferior cerebellar peduncle and b) VCT relays via superior cerebellar peduncle to the cerebellum. It conveys proprioceptive information and on-going activity in the spinal cord interneurons. Corticospinal (pyramidal) tract: From the motor cortex, premotor cortex, and somatosensory cortex. Has a role in sensory processing and fractionated finger movements. Rubrospinal tract: Originates from the magnocellular part of the red nucleus in the brain. It projects towards common structures with the CoST, particularly those involved with distal motor control. There is debate as to how significant this tract is. Vestibulospinal Tract: Originates from Deiters nucleus in the medulla and innervates the extensor and axial muscles. It is involved in balance control and posture. Reticulospinal Tract: This tract begins in the caudal reticular formation in the pons and medulla. Provides both excitable and inhibitory effects on the interneurons in the spinal cord, and to a lesser extent, it also acts on the motor neurons. Its main action is to dampen down activity in the spinal cord. without this pathway, there is increased extensor tone observed. Alpha and Gamma motorneurons (MNs) are both found in the ventral (anterior) horn. Alpha motorneurons are the largest motor neurons in the nervous system. They innervate skeletal muscle. Gamma Motorneurons innervate intrafusal muscle fibres of the muscle spindle. Motor neurons are arranged somatotopically across the ventral horn. The more medially placed MNs innervate proximal muscles while laterally placed MNs innervate distal muscles. 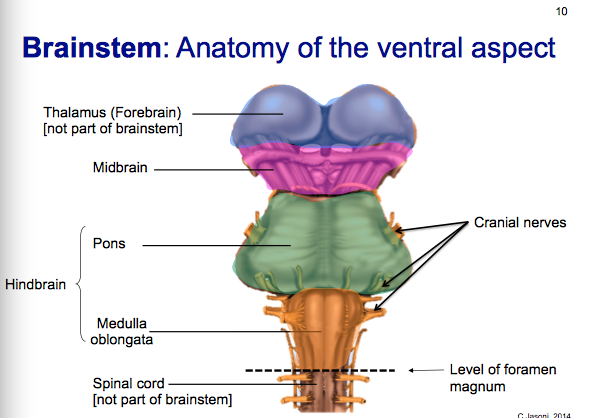 The brainstem is made up of the part of the brain that begins at the foramen magnum. It extends to the cerebral peduncles and thalamus. Vital respiration and cardiovascular centres. Ascending and descending pathways, linking spinal cord to brain. Arising from sub-clavian artery these two arteries enter skull through foramen magnum after passing through foramina in the transverse processes of the upper cervical vertebra. They unite in the brainstem to form the basilar artery which ascends to form the two posterior cerebral arteries at the superior border of the Pons. 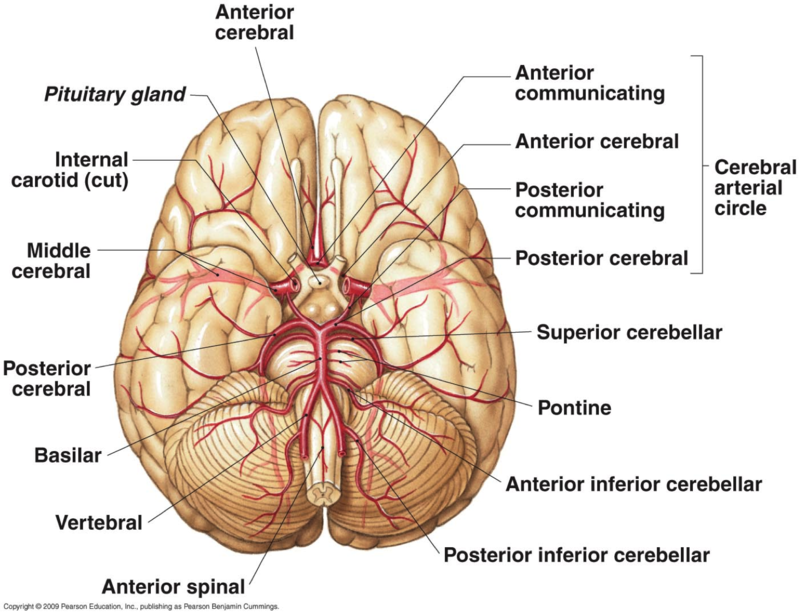 This is the posterior cerebral hemisphere blood supply. This network is termed the posterior circulation. On its journey to becoming the basilar artery, the vertebral arteries give off a number of branches, including the posterior spinal artery, posterior inferior cerebral artery and the anterior spinal artery. These constitute the blood supply to the upper cervical cord. The PICA supplies the lateral medulla and cerebellum. Traverse the skull within the carotid canal and cavernous sinus. They then pierce the dura and enter the middle cranial fossa lateral to the optic chiasm. They then divide to supply the anterior and middle sections of the cerebral hemispheres, anterior and middle cerebral arteries. The Anterior and Posterior circulation anastomose at the base of the brain. This is called the Circle of Willis. This has a number of branches: anterior and inferior cerebellar artery, artery to the labyrinth, pontine branches and superior cerebellar artery. These supply blood to the posterior parietal cortex, occipital lobe and inferior temporal lobe. There are several branches of this artery that supply the midbrain, thalamus, subthalamus, posterior internal capsule, optic radiation and cerebral peduncle. Venous drainage of the brainstem and cerebellum is straight into the dural venous sinuses which are adjacent to the posterior cranial fossa. The cerebral hemispheres have external and internal veins. External veins drain the cortex and drain into the transverse sinus. This then drains into the lateral sinus and empties into the internal jugular vein. Internal cerebral veins drain the deep structures of the cerebral hemisphere into the great vein of Galen, and then into the sinus. If occlusion of either of these venous systems then raised intracranial pressure can develop. The spinal cord is supplied by a single anterior spinal artery and paired posterior spinal arteries. Anterior spinal artery: arises from the vertebral arteries and extends from the level of the lower brainstem to the tip of the conus medullaris. It supplies the ventral medial surface of the medulla and anterior 2/3 of the spinal cord. The posterior spinal arteries supply the dorsal 1/3 of the cord. There are reinforcing branches from other arteries along the length of the cord. If occlusion occurs, it is normally of the anterior spinal artery, producing loss of power and spinothalamic sensory deficit, but dorsal column sensory capabilities are maintained. The cerebellum is found below the tentorial membrane in the posterior fossa. It is connected to the brainstem by 3 cerebellar peduncles. Its primary role is that of coordination and learning of movements. There are three main systems. Spinocerebellum - involved in the control of axial musculature and posture. Pontocerebellum - coordination and planning of intended limb movement. Vestibulocerebellum - involved in posture and eye movements. The cerebellum compares the intended movement originating from the motor cortex areas with the actual movement relayed back by the afferent systems and interneurons in the spinal cord. It also gains input from the vestibular systems. To act as a comparator: comparing descending supraspinal signals with ascending afferent feedback. If there is any discrepancy, this is then fine tuned to produce the actual movement desired via descending pathways. This helps to achieve smoothness and accuracy in movement. To act as a timing device: it converts descending motor signals into a sequence of motor activation. This helps the movement achieve smoothness and coordination, maintaining posture and balance. (receiving input from the vestibular system). Initiating and Storing Movement: has ability to store and update motor information. there is a significant role played in accurate learned movement. This is due to a modifiable synapse at the purkinje cell. The Neostratum is the main area of signal reception for the basal ganglia and receives information from the whole cortex in a somatotopic fashion. It relays signals to the thalamus which projects to the premotor cortex, supplementary motor cortex and prefrontal cortex. There is also a projection to the brainstem (pedunclopontine nucleus- involved in locomotion, and superior colliculus - eye movement). The hypothalamus lies on either side of the 3rd ventricle, below the thalamus and between the optic chiasm and the midbrain. It receives a large input from limbic structures. It has a significantly large efferent output to the ANS and has a highly significant role in the control of pituitary endocrine function. The hypothalamus as well as inputting the ANS also has a large part to play in the homeostasis of many physiological systems such as hunger, thirst, water and sodium balance and temperature regulation. it also plays a role in memory and emotional responses, providing autonomic and endocrine responses. It also plays a role in the control of circadian rhythms via retinal input to suprachiasmatic nucleus. There may also be hypothalamus input into sexual and emotional behaviour independent of its endocrine role. The PNS consists of nerve trunks that are formed from both afferent axons which conduct sensory information to the spinal cord, and efferent fibres which transmit impulses primarily to muscles. 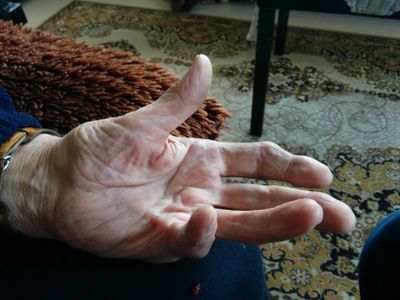 If a particular nerve is damaged, there is resulting weakness to the muscle it supplies as well as sensory loss from the region it conveys information from. The peripheral nerves connect with the spinal cord through foramina in the vertebra of the spine or with the brain through foramina in the skull. The main role of the ANS is to innervate the internal and glandular organs. Functions of the ANS include the regulation of “circulation, respiration, metabolism, secretion, body temperature, and reproduction.” The peripheral component is defined in terms of the sympathetic, and parasympathetic systems. Efferent fibres of the ANS originate from the intermediate zone (lateral column) of the spinal cord or specific cranial nerve and sacral nuclei before synapsing in a ganglion. These are different for sympathetic or parasympathetic systems. Afferent fibres from the organs innervated by the ANS travel via the dorsal root to the spinal cord. The ANS includes nerve cells and fibres which innervate internal and glandular organs.There are always two successive neurons; preganglionic with cell body in the CNS and postganglionic. Preganglionic neurons found in lateral horn of spinal cord from upper thoracic to mid-lumbar cord (T1-L3). Postganglionic cell bodies found in vertebral and prevertebral ganglia. Uses Noradrenalin as postganglionic transmitter. Preganglionic neurons have cell bodies in the brainstem and sacrum. Postganglionic cell bodies are found adjacent to or within the walls of the organ they supply. Uses acetylcholine (Ach) as postganglionic transmitter. Both Parasympathetic and Sympathetic systems use Ach at the level of the ganglia. 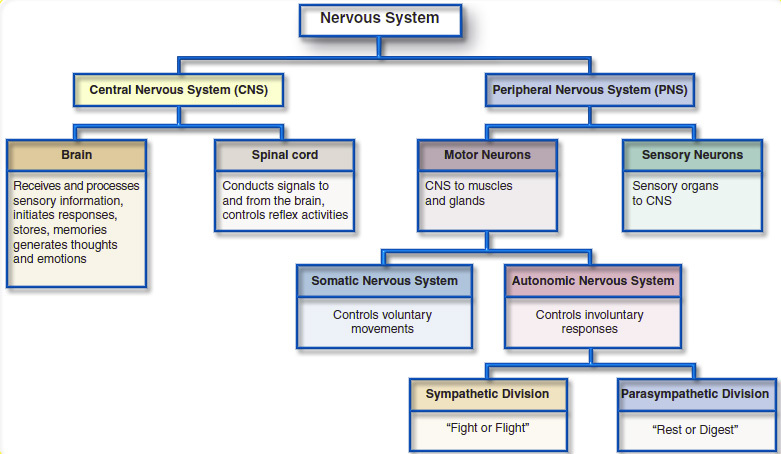 The Somatic Nervous System (SNS) is made up of nerves that are connected to skin, muscles and sensory organs (the eyes, ears, nose, skin, etc.). The SNS or voluntary nervous system is concerned with reactions to external stimulation. This system is under conscious control and is responsible for skeletal muscle contraction by way of the 31 pairs of spinal nerves. This system enables our voluntary control of muscles, as well as our reception of sights, sounds, sensations, tastes and smells. 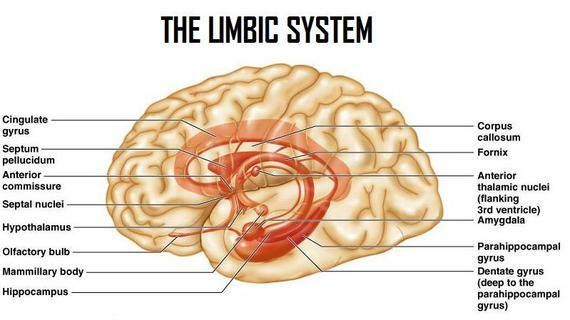 The limbic system provides high level processing of sensory information. 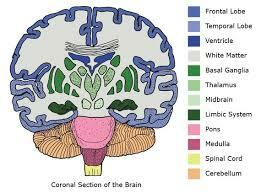 The main outflow of the limbic system is to the prefrontal cortex and the hypothalamus as well as to cortical areas. It appears to have a role in attaching behavioural significance and response to a given stimulus. Damage to this area has profound effects on emotional responses. Long term potentiation LTP is the increase in the strength of a synaptic transmission with repetitive use, it can be seen to be effected in the hippocampus and is thought to be important for memory acquisition. The sensory system is where information is transmitted to the spinal cord and brain from peripheral sensory receptors. These are specialised neurons or nerve endings. The sensory receptor, afferent axon and cell body are known as the primary afferent. 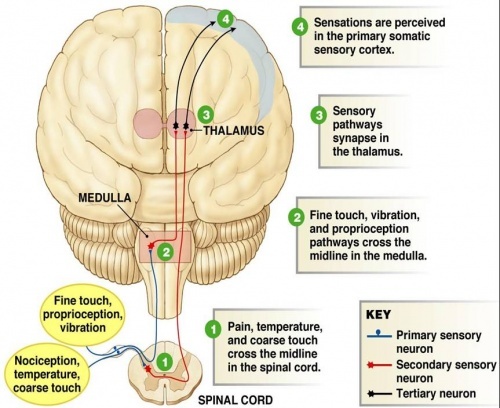 The process by which the signals are transmitted through this system is known as sensory transduction. The signal produced is sent to the CNS via peripheral or cranial nerves via several synapses, eventually terminating in the cortex where it is analysed. There are five main sensory systems in mammals. Pain is defined as an unpleasant sensory or emotional experience, associated with potential or actual tissue damage. Nociception defines the processing of information about damaging stimuli by the nervous system up to the level of the cortex. Potentially damaging mechanical, thermal, and chemical stimuli are detected by nerve endings called nociceptors, which are found in the skin, on internal surfaces such as the periosteum, joint surfaces, and in some internal organs. The concentration of nociceptors varies throughout the body; they are found in greater numbers in the skin than in deep internal surfaces. The nociceptors are unspecialized free nerve endings that have their cell bodies outside the spinal column in the dorsal root ganglia. Nociceptors are categorized according to the axons which travel from the receptors to the spinal cord or brain. A delta fibres: activated by high threshold mechanoreceptors. thinly myelinated. Unmyelinated C-fibres: activated by polymodal nociceptors(PMN) and respond to intense mechanical stimulation, high temperatures and irritant chemicals. Motor systems are the areas of the nervous system responsible for controlling movement. The movement can either be guided by input from the sensory systems (closed-loop) or triggered by a sensory cue, or an internal desire to move (open-loop). Most movements involve both types of control. Closed loop movements tend to involve the axial muscles (posture and balance) while open-loop movements involve the peripheral muscles (locomotion and fine skilled movements). Highest level - concerned with initiation, planning, and programming of the movement. Response to internal desire to move (limbic system and post. parietal cortex. Cerebellum - responsible for coordination of the movement. Control of lower descending neurons via supraspinal descending motor pathways (corticospinal/pyramidal tract and tecto and rubrospinal, vestibulo spinal, extrapyramidal). Low level motor organisation in the spinal cord. Descending motor paths, and interneurons. Mediation of spinal cord reflexes. This is where the central pattern generators are situated. Lowest level. output neuron of the CNS to the muscle (motorneuron). Receives important input from sensory organs in the periphery - the muscle spindle and golgi tendon organ.